The average value of a game skill for a starter in the NFL is 4 on offense and 3 on defense. After a kickoff, the offense starts in space 1. Outcomes are then determined by identifying crucial skill matchups in a drive. 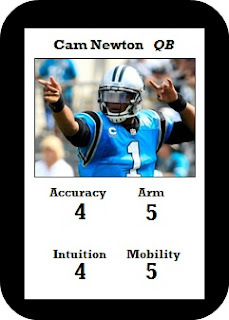 For solo play, flip a play card to determine which offensive and defensive skills to compare (e.g. running back's Agility vs. linebacker's Tackling). (I'm still figuring out the best way to handle this for head-to-head play.) Both players roll against their indicated skills, with success on a roll ≤ the skill's value. IF the offense succeeds, and the defense fails…move one space with the chance to move more (the matchup to continue is indicated on the card...this is how big plays are made). IF both succeed or both fail…one space if offensive roll > defensive roll, none if not. IF the offense fails, and the defense succeeds…it's fourth down. Two consecutive plays of no movement lead to fourth down no matter what. The offensive coach can then choose to go for it, punt, or try for a field goal. 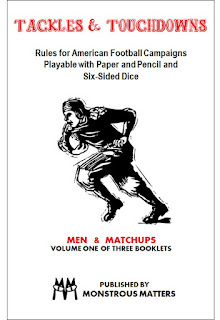 If successful on fourth down (moving at least one space), continue as normal; if unsuccessful, the ball changes hands at the current space. A punt moves ball two spaces (or one space if in space 3). Field goals are made on 5 of 6 if in space 4, 3 of 6 if in space 3.